When you’re out photographing a beautiful location it is really easy to ignore the little details. As nature photographers we often default to “wide vista” mode and try to capture as much of a scene as physically possible. A problem with that approach the image can become very generic. Sure you’ve captured a very nice scene, with gorgeous light, but does the image tell a story or is it just pretty? The number of images that we are subjected to on a daily basis is staggering. Everywhere you look there is an image being displayed. It might start with the morning paper or the bumper sticker on the car in front of you during your commute. We’re barraged by images in print media, on the Internet or coming into our homes via the television. That constant flood of images numbs our senses to the minute detail that makes up the world around us. That detail is often lost in the vast, grand landscape images that we try to create. That isn’t to say that I don’t enjoy capturing that type of image as well, because I do. It is, however, important that we occasionally look beyond the vista and see what is really happening around us. Doing to adds impact and meaning to our photographs. This is a very simple image but it tells a really intricate story. I took it early one morning on the shore of [wikipop]Mono Lake. [/wikipop] Stories suggest that the lake was actually named by neighboring peoples rather that the Paiutes that lived there. The word Mono is believed to have been derived from a Yokut term meaning “fly eater”. The extreme salinity of the lake prevents most organisms from living in the lake with just a couple of exceptions; that alkali fly and the brine shrimp. Long ago the larve of the alkali fly was the primary food source for the Mono Lake Paiutes. Today those two organisms, and their place in the food chain, make Mono Lake a huge habit for migratory shorebirds. The shorebirds aren’t aware of the political fight over Mono and it’s water, they just come for the shrimp and the fly larvae; that’s really what Mono Lake is about. I was at the lake on a Gary Hart workshop that I was assisting with. It was a pretty morning but not really remarkable so I stopped shooting, while the students kept clicking away, and just started looking around for detail. The making of the image was slightly challenged by a breeze that started to build as the sun rose. To compensate for some movement I raised my ISO to 400 so I could use a faster shutter speed and ended up at 1/45 of a second. I was using my Canon 100-400 to isolate this tiny scene as was zoomed all the way in at 400mm. I’ve written previously about using that lens for landscape work. It’s not what many folks think of for the genre but I find it to be indispensable. 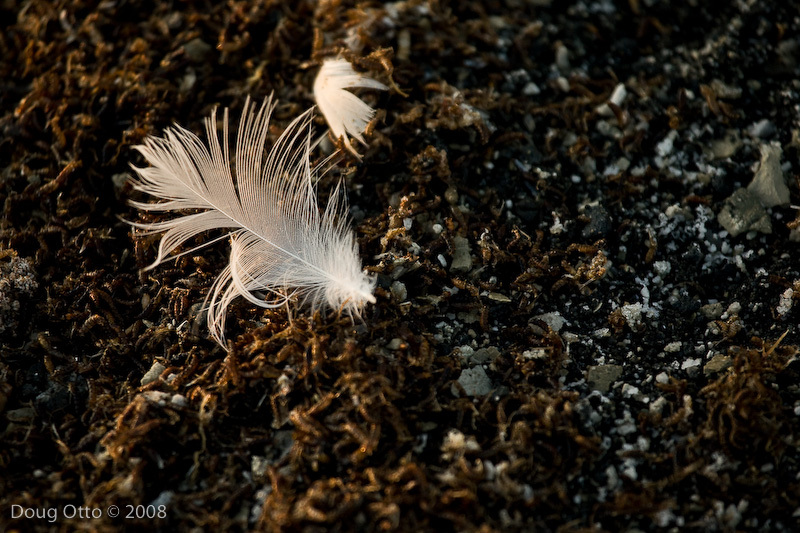 I choose my widest aperture, f/5.6, to help with the shutter speed but I also wanted to minimize the depth of field to exaggerate the feather as the anchor of the image. This entry was posted in Photography and tagged doug otto, Eastern Sierra, Feather, landscape lenses, Mono Lake, Photography, Sunrise Canon 5D. Bookmark the permalink.